Marine-Plus.Com Wagner Universal Rudder Follow-Up Repair Kit (New) For the Boating Community! Rdder Follow-Up Repair Kit FOR Commercial Type RFU (New, UNIVERSAL Sensor w/Gear Assembly)! If Your Wagner, Autonav or Jastram Commercial Grade Rudder Follow-Up Unit Still has a GOOD Condition Case ... Use This Repair Kit & SAVE MONEY! Gear is Removable to Reverse on Shaft As Needed for Height Alignment to Your Larger Gear, depending on Year Manufacured! Also NOTE the 20 Tooth Gear is Not the SAME as the one Used in the Original Wagner Cast Aluminum Built RFU ...Must use Your Original Gear with 17 Teeth! 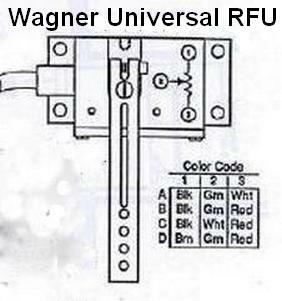 Also Used in Wagner TS-2R FFU Control Lever. SHIPPING 1 BIZ Day After Purchase ... 1 READY To Ship NOW ... MORE Available For CUSTOM Orders So Contact Us!